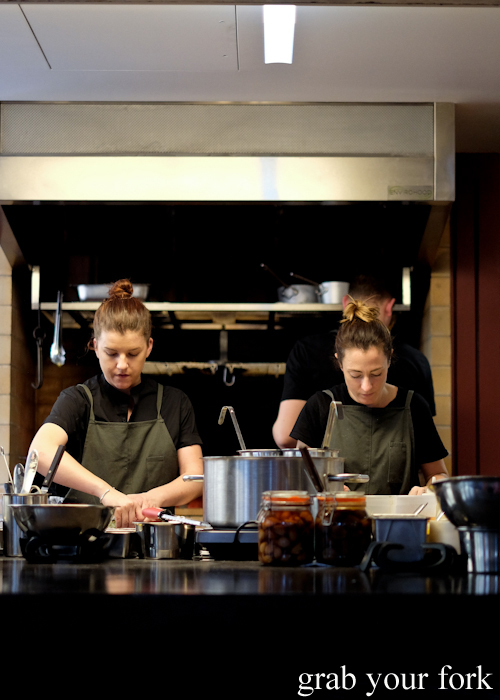 It's been more than two years in the making, but Poly, the long awaited sister restaurant to Ester (geddit? ), finally opened last week. 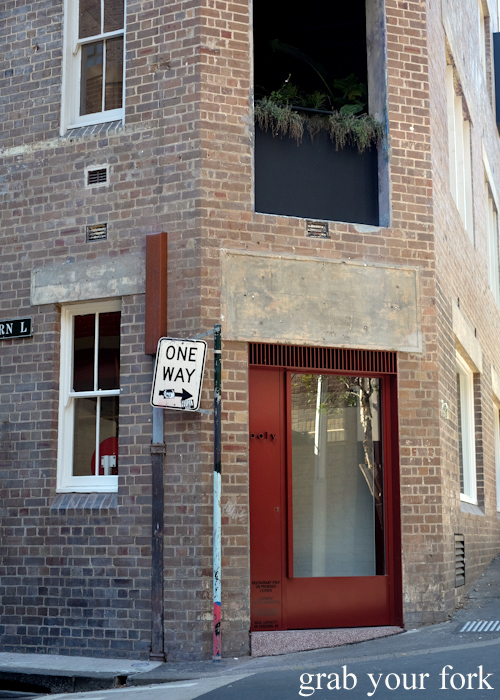 Mat Lindsay's Poly takes up residence on the ground floor the newly renovated Paramount House Hotel, ostensibly designed as the hotel restaurant but self-described as a walk-in wine bar. 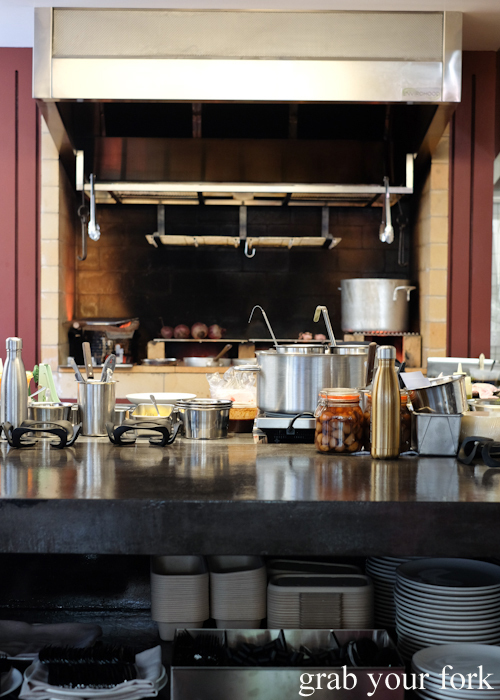 Wood fuels the kitchen, a remarkably open set-up that allows diners an unencumbered view of all the action. The glowing charcoal is used to simmer, grill and smoke, sandwiched either side by a deep-fryer and a combi oven. 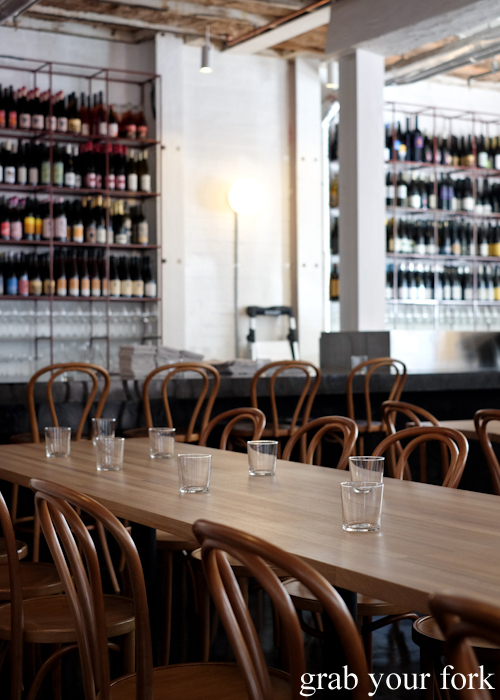 Truth be told, the space feels more like a restaurant than a wine bar, with long communal tables dominating the room. A massive L-shaped bar counter follows two walls, shadowed by a wine display stacked four shelves deep. Small tables for two line one wall, and there's one round marble table by the kitchen, just like Ester. 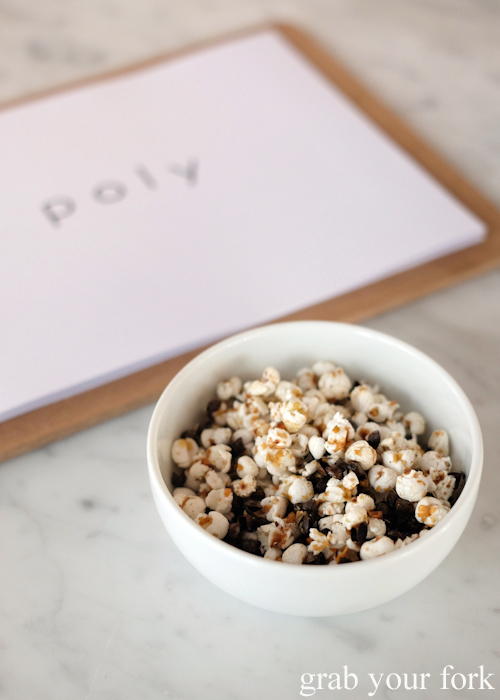 Complimentary bowls of buckwheat popcorn are a nod to the building's past as the film storage warehouse for Paramount Pictures. It's a welcome salty hit, although their petite size make them finicky to eat in any significant quantity. 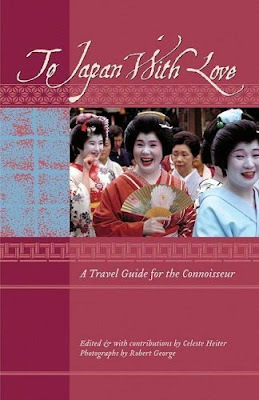 The drinks list is expansive running from sake (ten) to skin contact wines (over 20 bottles) and everything in between. 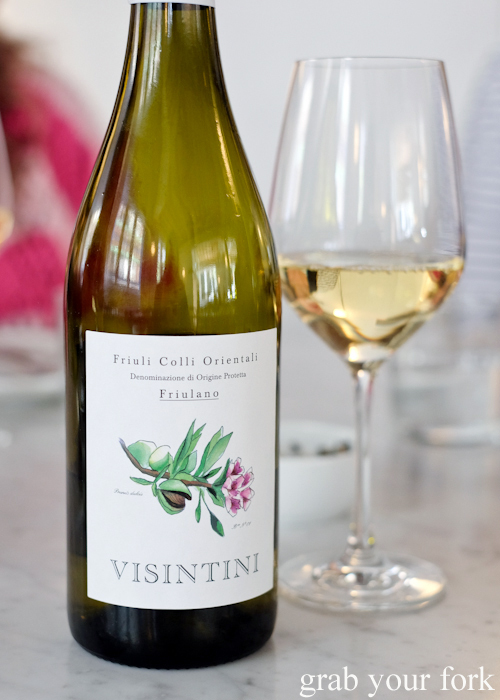 Wines by the glass run for an entire page (20 options). Spirits and cocktails abound but there are only two beers - an ale on tap or a bottled spelt sour ale, both by Wildflower brewery in Marrickville. 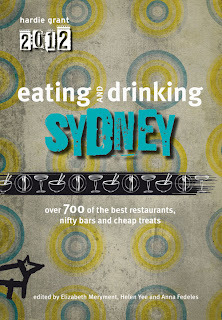 The menu reads like a list of ingredients, starting with snacks like Kangaroo Island scallop with salted egg or grilled oyster with fingerlime and horseradish and graduating to larger dishes like chicken with white beans and buttermilk gravy. 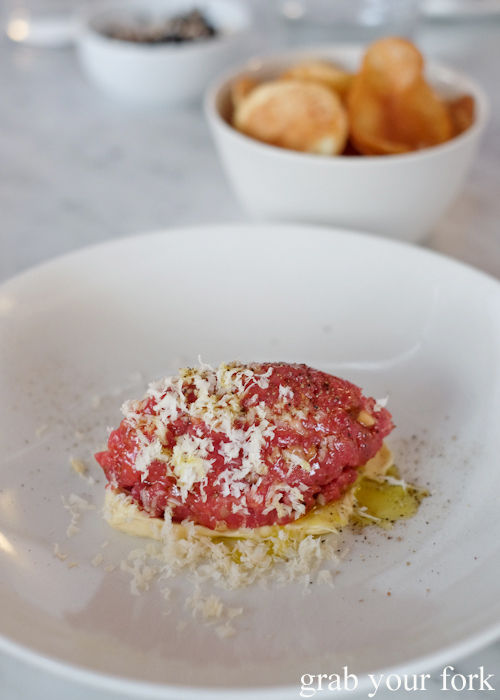 The beef tartare is an ideal place to begin, a quenelle of finely chopped and beautifully coloured beef flavoured with fermented hot sauce and a snowfall of freshly grated horseradish. 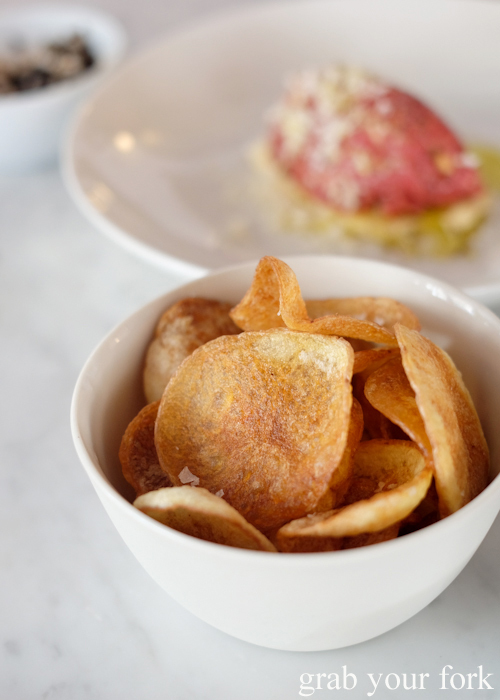 Housemade potato chips almost steal the limelight, wafer thin salted crisps that yield a satisfyingly noisy crunch. Salt and vinegar haystack onions are also addictive. 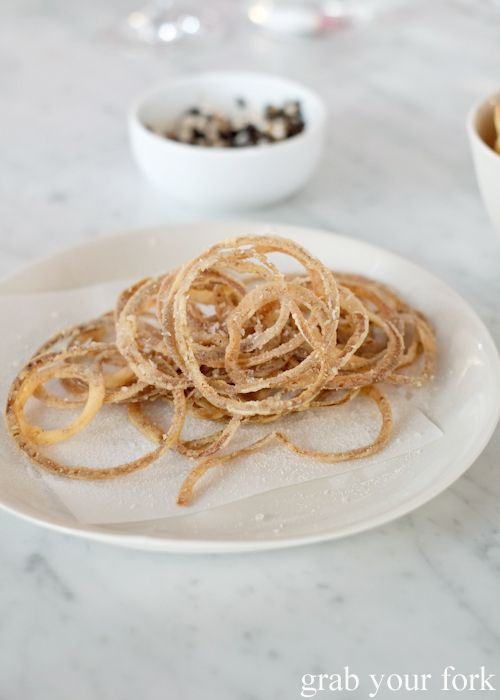 The super fine slices of onion are brittle and crisp, with just enough salt and vinegar to have your mouth puckering for more. 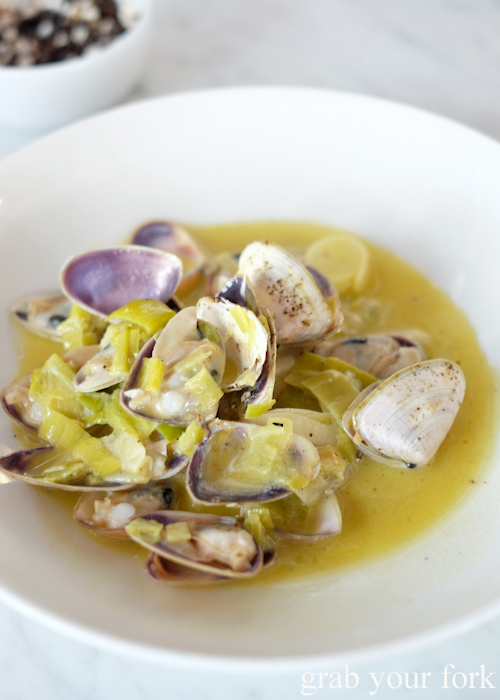 What looks like a simple serve of pippies with leek and chilli belies the complexity of the buttery lake of sauce it sits in. We wrest the tender cooked bivalves from their shell and then use the empty shells to drink up the sauce, gently salty with the taste of the sea. 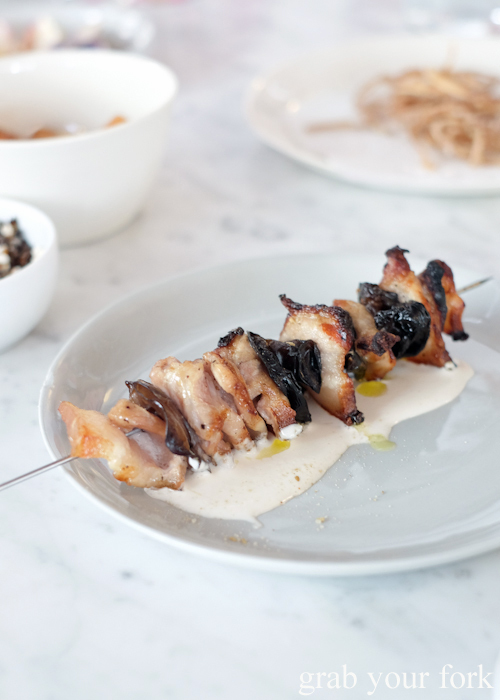 Pork belly with black fungi on a skewer isn't an obvious pairing but it works. The fatty pork belly slices, slightly charred and sticky at the edges, contrasts with the cleansing crunch of black fungus mushroom. A smooth and silky macadamia sauce brings everything together. 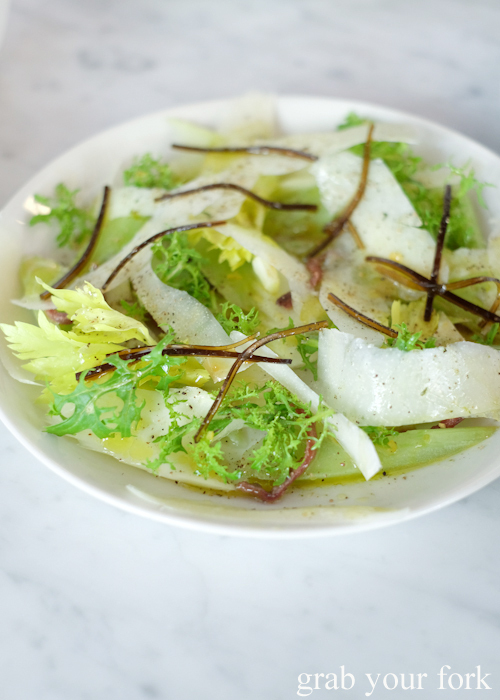 The celery caesar is described by our waiter as "like a Caesar salad without the bacon and a stronger taste of celery". It's not particularly reminiscent of a Caesar salad to my tastebuds (no croutons, egg nor creamy dressing) but as a salad, it's delicious, even if the narrow strips of seaweed are a non-Caesar-like addition. Much more of a hit is the beetroot with labneh and Davison plum. 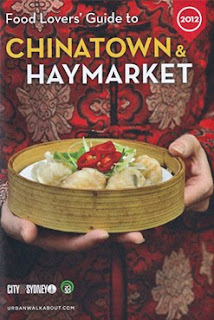 Its presentation alone is worth studying, the swipe of labneh and Davidson plum sauce resembling an edible artwork. 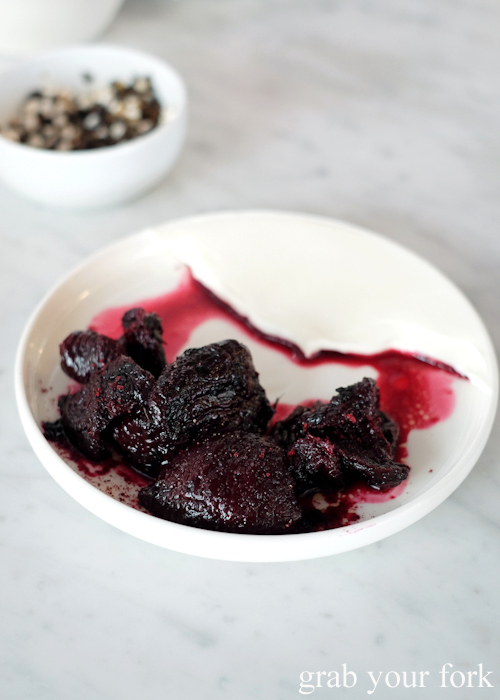 The beetroot has been dehydrated and then rehydrated, a process that results in a concentrated beetroot flavour. It's like a wrinkled beetroot candy. Labneh adds a tangy creaminess, offset by the sweet acidity of Davidson plum. 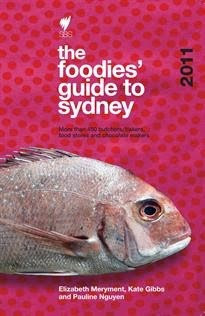 Ester fans will know the blood sausage sanga on the menu well. Here at Poly, Lindsay and head chef Isabelle Caulfield, have hidden the blood sausage within a pie. It's worth hunting down. 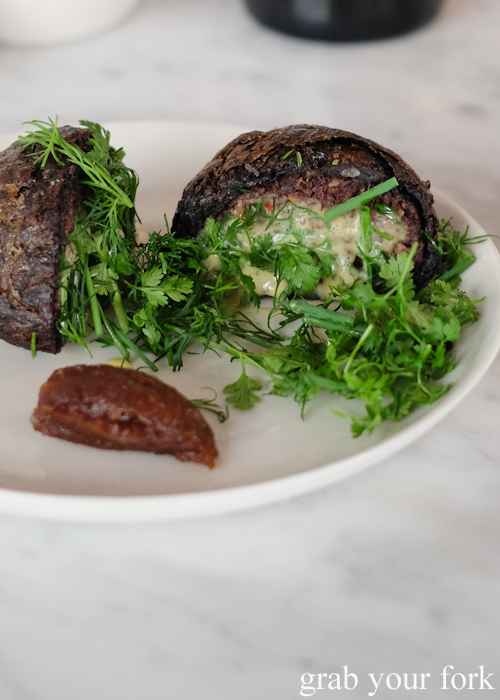 A hemisphere of deep brown malt puff pastry holds the blood sausage filling, the pie itself split in half and then sandwiched together with herbs. 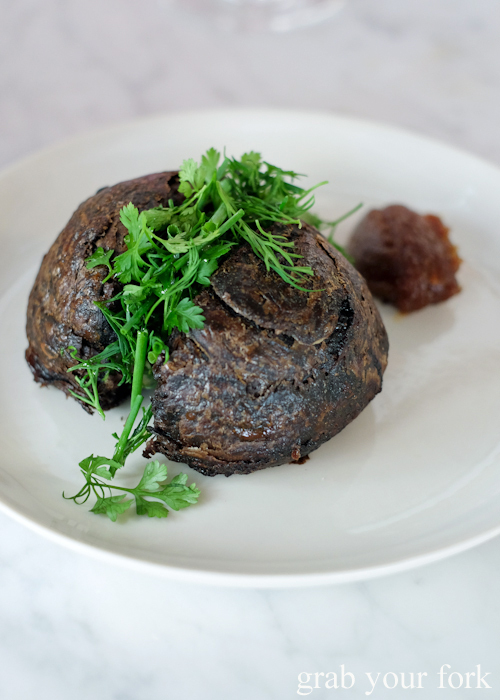 The pastry is feather light and flaky, a contrast that works well against the softened stickiness of the blood sausage inside. It's a terrifically elevated dish and one of my meal highlights. We move onto the lamb chop with intercostal. The chop is cooked to a blushing pink. There's a fight for all the fatty bits near the bone of course. 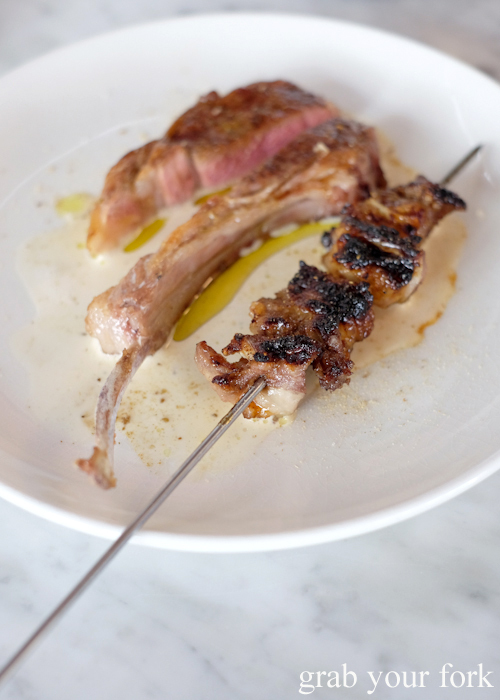 But it's the skewer of intercostal - all the bits of meat between the ribs - that's the real star. It's juicy, fatty, caramelised lusciousness. 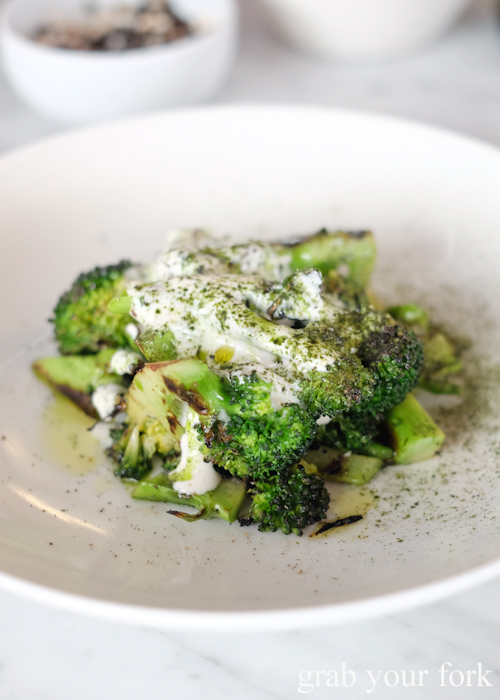 Against the richness of the lamb, the broccoli offers a great foil, its florets charred to a nutty brown and dusted with nori seaweed. The most substantial dish on the menu is the chicken with white beans. 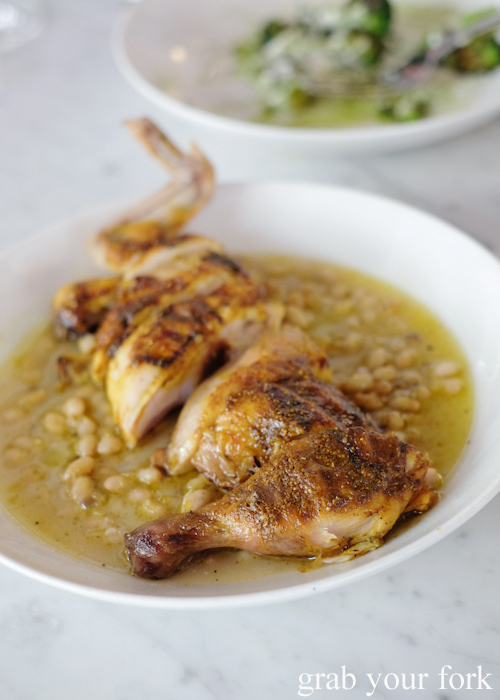 There's a lipsmacking succulency to the chicken, offset by white beans that are on the chewy side of al dente. My other favourite dish of the day is the salt baked potato with smoked whey. 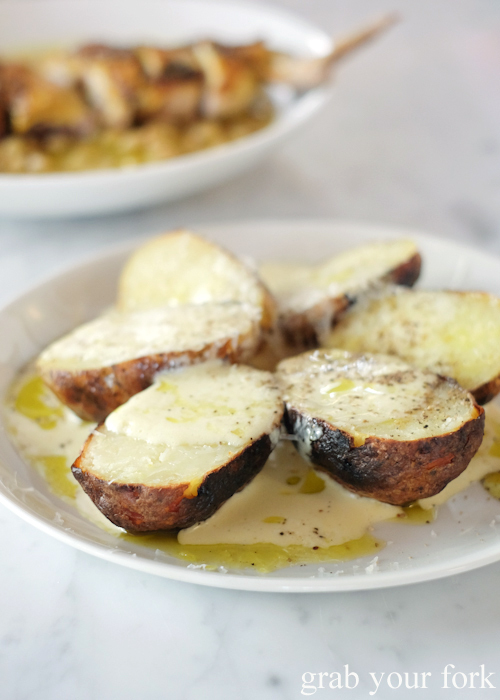 The potatoes have been baked in their skins in salt, magnifying their potato-y essence. We suspect they're grilled again so the skins became a papery crisp before they're split in half and doused in a smoked whey sauce that is toe-curlingly good. It's seriously swoonworthy. We scrape the plate clean and order another serve. I expect you will too. Oh my what a wonderful menu. I am a sucker for beef tartare, and now I have got my kids onto it and have to fight them for it when it lands at the table! Wow..... 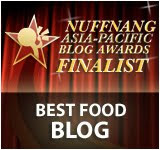 I just got the name, god I'm slow :) Food looks great! I zeroed in on the carbs! The Salt baked potato looks fantastic! It looks very much like Ester, very clever and I can't wait to go. You know you have really done it now because they won't be able to make enough of those potatoes. Oh what scrumptious morsel so prettily presented. And so many wines to try. I, for one, cant resist a combo like that!